We are here to be a resource for you. 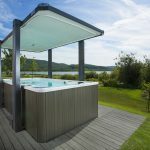 The process of researching and purchasing a spa or swim spa can be overwhelming. There are a lot of products on the market. A consumer has a big task simply in learning to tell the difference between the good companies, the great companies and the companies to avoid. The price of a spa means something, but the value of a spa, the reputation of the company and the trust you have in your salesperson are all far more important factors than the price tag on the spa. The better your relationship with your salesperson, the higher your spa value will be and the more money they will save you by managing the process professionally and ethically for you. Gone are the days of huge, multi room showrooms with thousands of spa models on site and hovering sales guys waiting until a moment of weakness to start a conversation. Spas are a commodity – with thousands of comparable models on the market varying across the board in price and in features. Consumers have the power of the internet – to research and compare before stepping foot into a showroom or picking up the phone. We work with you in our showroom and over the phone to ask you targeted questions about your needs, the features you are seeking, the price range you are looking in – we listen to your answers and we make recommendations based on your criteria – saving you time, stress and eliminating uncomfortable conversations in a high pressure environment. 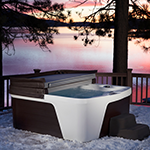 We send you photos, brochures and links to the spas you are interested in, so you can learn all about the features. 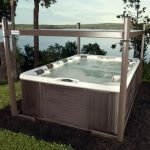 Finally, if you wish, you can visit our showroom to view a few model spas in person before you purchase – many people love to do so, but we find that most people these days prefer to make their spa decision in the comfort of their living room. Then, they just call us up at their convenience to place their order with a credit card or quick financing application. We always look forward to having the added benefit of meeting you in person when we deliver your spa! 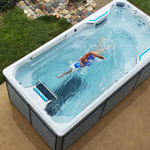 Swim Spas are more complicated because there are so many different types of swim currents, features, model sizes, and price ranges available. We work with most of our customers between one month to a year prior to delivery, assisting them in our showroom, over the phone and in email with answering questions and providing pricing, assisting in person in our showroom for swim test visits, visiting homes for yard and pre-delivery walkthroughs, providing quotes, qualifying for financing, placing orders and taking their down payments 4-6 weeks before delivery, and scheduling & coordinating delivery with contractors prior to and on the day of delivery. Once the swim visit completed a quote will be provided to you for specific models. Owner’s manual, Warranty information and contractor checklists provided to you for planning with contractors. You settle on model choice / size, call to find out details on cover lifts, accessories, sale models available, special pricing incentives, etc. Sales person provides all details to you promptly after final approval from manager. Yard visit completed – delivery process approved and quote from crane or forklift included in your quote for budgeting purposes. 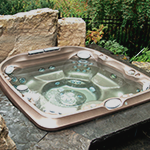 You make the buying decision, call to place down payment order on swim spa or spa. Sometimes financing is applied for (terms available on request), sometimes a credit card is used (for up to 25% of cost), sometimes a check is mailed. Contract filled out and signed by both parties prior to swim spa order being placed. Delivery is made to you 4-6 weeks* after order is placed. *Timing can vary depending on time of year and available stock. I already know what I want, can I buy over the phone? Yes, it happens all the time. I’m in a different area – where can I test these? Make an appointment to fly or drive to see us and take a swim test. Do I work with the same person the whole time, or do I have to explain what I want to different people every time I call? You will work with the same salesperson through the entire research and purchase process. You may have a different team member assisting at your swim visit or at your delivery, but one of our small team of experts will be there in person at every turn. We all communicate and keep track of our customer notes very carefully, so you can be confident that nothing will be lost in translation. Can I Pay with Cash or check? Yes. You can pay with Cash, Check, Credit Card or easy financing options.